I modelled and animated the Piranha in Softimage 3D. This display shows what the model looked like on the screen of the SGI. He is built out of b-spline patches. The upper left window modelling window is in "ghost" mode, which shows overlapping images of the model as it appears in different frames (it is similar to what traditional 2D animators used onionskin paper for). The camera's view of the current frame is seen in the upper right window. The red and blue structure running through the fish is the inverse kinematic skeleton I used to create overall bends and twists (I actually was animating with forward-kinematics, keyframe animating joint rotations). Other motion in the fish, such as the mouth opening, gills opening, and cycles of motion for the dorsal and lateral fins, were accomplished with shape animation. 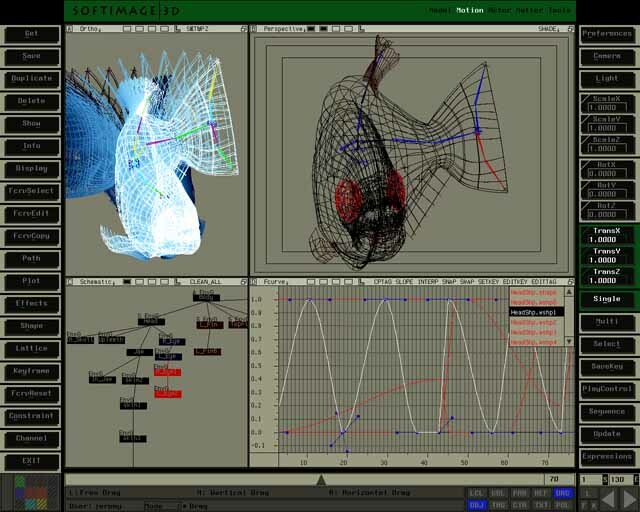 To create shape animation, I built multiple versions of the parts of the fish I was going to animate, for example, I built one version of the head with an opened mouth, a version with the mouth closed, and a version with the gills flared outwards. Then these versions were assigned as target "shapes" for the head, and the "Fcurve" window on the lower right shows curves I could adjust showing the "weights" over time that blended these different shapes into the final head pose for each frame. The hierarchical structure that you see part of the in "Schematic" window on the lower left shows the relationship of all the parts of the character being grouped together with it's skeleton, and rotating eyeballs, etc. 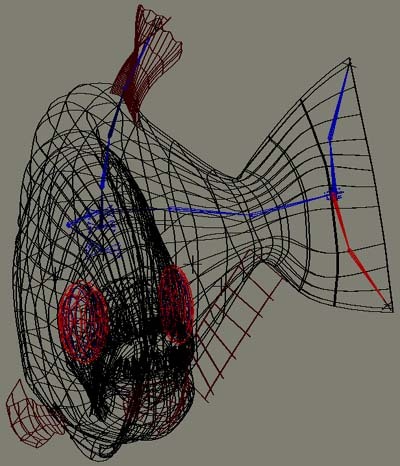 Additionally, several "expressions" (mathematical equations you can type in to establish relationships between different values in a scene) were used in setting up the Piranha, for example, to make the the teeth rotate into the right position to stay lined up with the shape-animated mouth. Here's a clearer view of the piranha's geometry. Notice that the edges of the tail and lower fin are actually straight lines, while they have a more complex shape in the rendering. This is a trick done with transparency mapping. In addition to a colored pattern coming from a map created in Adobe Photoshop, I also created a transparency map. Both are shown below for the lower fin. The transparency map can do 2 things: (1) The white (completely transparent) parts of the map HIDE a portion of the surface, essentially trimming it into a new, more complex shape, without needing to model the details of that shape and (2) Intermediate gray shaded areas of the map create a partially transparent surface, and the pattern reenforces the ribbed pattern defined in the color map. 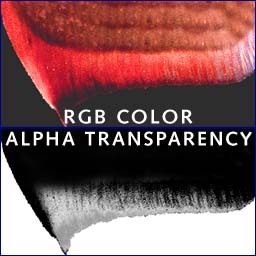 For Softimage, I can actually put the transparency map into the "alpha channel" (4th channel after RGB) of the file, so color and transparency mask are stored in one PICT file from photoshop, and converted into a 4-channel softimage format file on the SGI. Another type of "double-packed" map that I used on most surfaces had specular maps in the RGB channel, and bump in the alpha. For more info on specular maps for characters, see behind the scenes info on how I textured the heads in my thesis (jump there).